Located on 14 stunning acres, Dolphin is one of Fiji’s latest luxury resorts to reopen following an extensive renovation and refurbishment. This entirely private Pacific island now boasts a magnificent new presence offering hospitality for 2-8 guests, for the ultimate, private, all-inclusive experience. Just 20 minutes by private boat from the main island in Fiji, Viti Levu, Dolphin Island is nestles in beautifully landscaped tropical gardens, surrounded by crystal clear waters. Renowned interior designer Virginia Fisher has created a setting on the island that offers an extra-ordinary guest experience. From colors, textures and patterns found in the Pacific along with her superb sense of style, every guest comfort has been considered from the most absorbent of towels to the most heavenly scented candles. All of this, and more, creating an effect that is utter magic. Dolphin Island Guest Bure Suites are perfect for a Pacific Island lifestyle – featuring heart timber floors, plaster walls, stone tiles, wooden shutters, high ceilings and the latest in air conditioned comfort. Dressing rooms are large and generous, further complemented by well appointed bathrooms, twin hand basins, shower, sculptural free standing bath and outdoor shower, within a private garden courtyard. Fine pure cotton bed linen and soft feather pillows are perfectly suited to the climate and The Huka Retreats famed attention to detail is strongly evident within this haven of relaxation and barefoot luxury. For total romance, guests can take an easy stroll to the top of the island where the Hilltop Sleep Out Bure awaits. 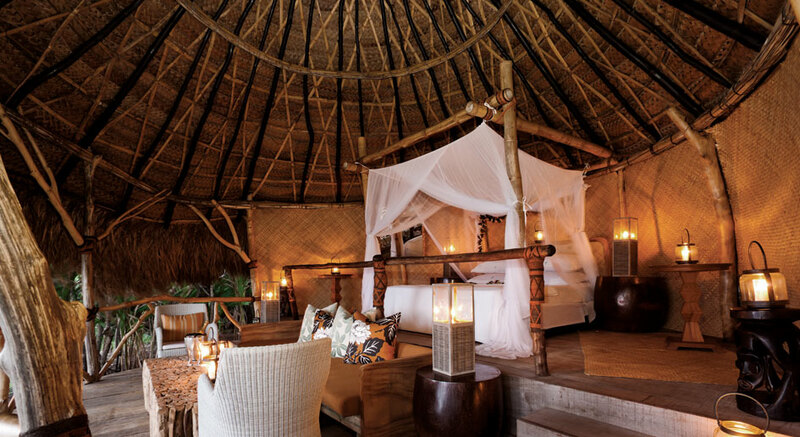 This utterly divine, thatched open-air bedroom is rustic and refined – perfect for a tryst or for an overnight stay! It faces the sea and is flooded by the first rays of the sun come daybreak. Lanterns and candles provide lighting, and a simple bathroom with shower and toilet, are located to one side of the sleep-out. With an entire private island as their playground, guests never feel the need to leave. Should they choose to take explore – a wonderful variety of experiences are available. Aquatic adventures abound, with warm, clear waters and coral reefs providing the perfect habitat for amazing marine life. Guests can snorkel, tank dive, sail, kayak, swim and fish, with carefully selected operators whose local knowledge is invaluable. Water sports involving waterskiing, wakeboarding, windsurfing, kite surfing and jet skiing are readily available. Cultural visits to nearby villages, sightseeing and tours to areas of historical interest can also be arranged, as can pampering massages and facials. The dining experience on Dolphin island is best described as Fijian fusion – a unique blend of traditional local flavors and ingredients combined with elements of Indo-Fijian cuisine creates a fabulous array of taste sensations. Spices, chilies, coconut, seafood, fresh fish, limes, indigenous vegetables and exotic tropical fruits all feature on the menu. Guests enjoy the best Fiji has to offer when Dolphin Island host, Dawn Simpson, is preparing dishes for their enjoyment. Dawn is also happy to generously share the secrets of her kitchen with guests during their stay and to take them to the local market where she goes to carefully select her produce. If you have special needs it is no problem! We simply advise the Dolphin Island team in advance and they prepare for your arrival, as guests are free to choose what they would like to eat. The menu will be created to suit the style of food that is their personal preference. Every day, as one of the local fishermen returns to port with his catch, he calls into Dolphin Island where guests are encouraged to select fish and seafood to eat later that day. Eating freshly caught fish is a truly a memorable experience, as is the traditional lovo feast prepared for the farewell dinner for guests. Delicious parcels of food are lovingly prepared and carefully wrapped in banana leaves before resting on hot stones under the earth, where they will slowly cook for several hours before the lovo is ready to be served. Dolphin Island has many fabulous dining venues and guests are encouraged to enjoy as many of them as possible during their stay. The elevated wide wooden plantation style verandas catch a gentle breeze, while overlooking the infinity pool. The floating pontoon has a table in readiness for breakfast or a candlelit dinner and tables can be set up at very short notice beside the pool, on the beach, or wherever guests feel they would like to dine. Dolphin Island offers a full range of spa services available in the comfort of your Bure or on the beach. Children of any age are permitted at any time of the year, as this is a private island and is only reserved by one party, per stay. Dolphin Island offers a luxurious all-inclusive private island experience in Fiji. Your stay will include all of your meals, all beverages including beer, wine and spirits and most resort island activities. As our valued clients, you will receive a fresh flower lei greeting upon arrival and entrance into Fiji Airway’s Airways’ airport first class VIP departure lounge on your last day – when you book your flights and accommodations with us. We will coordinate every aspect of your trip as much as you like. Please inquire for the latest rates and special offers.